Poetic justice and the life and killings of Joran Van der Sloot. Joran Van der Sloot supposedly fears for his life in the maximum security Castro Castro Peruvian prison, well it is about time he fears something … let it be a character builder for him. It has been an amazing and fitting turn of events for Joran Van der Sloot in the past month. Joran Van der Sloot went from continually torturing the family on the 5th anniversary of slain Alabama teen Natalee Holloway in Aruba in 2005 by trying to extort money from them for information to the murder of Stephany Flores in Peru to being charged with first degree murder and robbery and incarcerated in a Peruvian prison. If Joran Van der Sloot thought the Peruvian public reaction to his confessed murder of 21 year old Stephany Flores was something, wait until he gets to the maximum security Castro Castro prison. The Peruvians tossed insults and vegetables at Van der Sloot in disgust for what he had done. Imagine how that will translate in prison. Guess what Joran, even convicts of a code and they will be hardly enthused that a foreign national killed a Peruvian girl. Joran Van der Sloot claims he fears for his life in the Peruvian prison; however, woman of the world feel much safer now that this sociopath is behind bars and facing murder charges.Shouldn’t we care more about the world public safety that Joran Van der Sloot? Aruba gave this POS a get out of prison free card and emboldened him to kill again as he saw there were no consequences to his crime. Now thanks to Aruba and all those who helped Joran skate, he has killed again. The worst part about it is that Aruba did not relegate Joran’sacts to their own island, they inflicted this sociopath on the world to do as he pleased. Now that Joran Van der Sloot finds himself in the very cage he belongs, the ‘Sporter” fears for his life. Just for clarification Joran, your Peruvian cage is a much different one than a crab cage isn’t it … but none the less still a cage which adds to the continued poetic justice you are finally receiving. Suddenly Van der Sloot wants to come clean regarding Natalee Holloway? Funny, didn’t Joran Van der Sloothave that opportunity back on May 10, 2010 when he met with attorney John Q. Kelly and the FBI extortion sting where the reprobate promised Natalee’s resting place for money? We see where that went now, didn’t we. Will there be ramifications to Joran Van der Sloot’s admission that he sold Natalee Holloway for $10,000 and in the process admitted to kidnapping and human trafficking? Did Joran implicate his father in a crime, let alone the many other names he mentioned during the interview that he claimed had knowledge or participated in the crime and cover up? Will the Aruban prosecutor do his job and either prove or disprove Joran Van der Sloot’s latest admission to what occurred in the case of missing Natalee Holloway? How many times is Joran Van der Sloot allowed to confess to a crime, only to then say he was lying? Hans Mos has a responsibility to follow up on these admissions as well as other new evidence that has come forward. As his own US attorney Joe Tacopina stated, “he’s a sick kid”. If as Tacopina said that Joran is incapable of telling the truth then why does he or any of the other attorney representing Joran Van der Sloot think that the “sick kid” was telling them the truth? Why wouldn’t the converse also he true when Joran states that he had nothing to do with Natalee’s disappearance? If Joran is a liar as Tacopina states, then one must also believe that he lied to his attorneys in saying that he was innocent of any crime with regarding to the disappearance of Natalee. John Q Kelly … Joran Van der Sloot has something to hide. 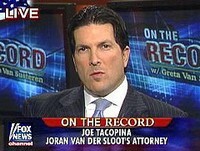 Geraldo: John, first of all you’ve got the Joran Van der Sloot situation. He confesses on tape, how strong is the case against him? John Q. Kelly: I think they have a very strong case Geraldo. He goes to Carlos & Charlie’s a half hour before closing. He buys Natalee a drink, he takes it from the bartender, he walks over to her hands her the drink, stands there, she finishes the drink. Within 20 minutes she’s incoherent, she’s lapsing in and out of consciousness. ARUBAN COVER UP AND CORRUPTION … WHERE IS JORAN VAN DER SLOOT’S 5/31/05 WITNESS STATEMENT? John Q. Kelly briefly discusses the Dutch reporting of a civil case possible being brought against Joran Van der Sloot by the parents of missing Natalee Holloway. At the moment it appears to be a non-story as Beth Holloway has had no conversations with the attorney in question. However, the real question that has to be answered is what part did the Aruban police take in the cover up, corruption and destruction of documents and evidence in the case of Natalee Holloway. If they covered up and destroyed the initial witness statement, what else did they subsequently destroy as well? Possibly evidence taken from Deepak’s car? Once one questions police actions … all of their actions come under scrutiny. Since the beginning of the investigation Beth Holloway had made references to a crumpled up piece of paper on that looked like a statement that was on the desk at the police station when she spoke with the ALE discussing her Natalee’s disappearance. Scared Monkeys has always questioned why there would have been no statement from Joran Van der Sloot, yet everyone else had been questioned at the outset. Are we really supposed to believe that no witness statement existed from the #1 prime suspect, Joran Van der Sloot, who was last seen with Natalee Holloway until 6/9/05. The very same witness statement that Joran van der Sloot actually references in his own book. The very same witness statement that most likely gives rise to a confession and admission of guilt and where the ALE knew to ask questions of seizures. Greta: He must have told the police that first time he spoke with them because why would they have asked Jug about the shaking and the epilepsy type seizures or something? I think to myself, what are the Aruban police up to? But that is for another day. John Q. Kelly: May 31st Joran was the first person interviewed by Jacobs who was taking statements. Every police report subsequent to that. The statements made by Deepak, made by Satish, made by Beth that day we have them all. There is no statement from Joran until June 9th. Oh, I guess Joran Van der Sloot is lying here too? WHAT WITNESS STATEMENT? NO ONE HAS EVER SEEN SUCH A STATEMENT! WHAT HAPPENED TO IT AND WHERE IS IT? WAS IT DESTROYED BY THE ARUBAN POLICE? Interestingly enough we seem to have most, if not all the witness and suspect statements (HERE) from the initial parts of the investigation. All, but Joran Van der Sloot’s 5/31/05 statement that is in question. The very same one that probably tipped off the Aruban police to ask Beth Holloway and Jug Twitty about whether Natalee Holloway had a history of seizures. Joran rides bus to school, takes exam, visits with principal Werner and sleeps in sick bay. Paul calls school at 10:30am. Jan van der Straten wants Joran to give a voluntary witness statement, since the family was creating quite some noise. Paul meets with principal, then he and Joran head to Bubali Station. Aruban OM says the decision about arresting Joran will not be made until wednesday. The courts gave Jorans attorney until wednesday to make his “vision”about the case clear. UPDATE I: John Q. Kelly on Fox – How much more of a confession do they need to arrest Joran van der Sloot?